I’m beginning to believe Mushu can read. She gets so excited when the box with “Chewy.com” on the side of it gets delivered. She knows there is something new for her to try. She also seems to know she will be getting a few more treats than usual so that we can see if she likes them and if she has any type of reaction to them. 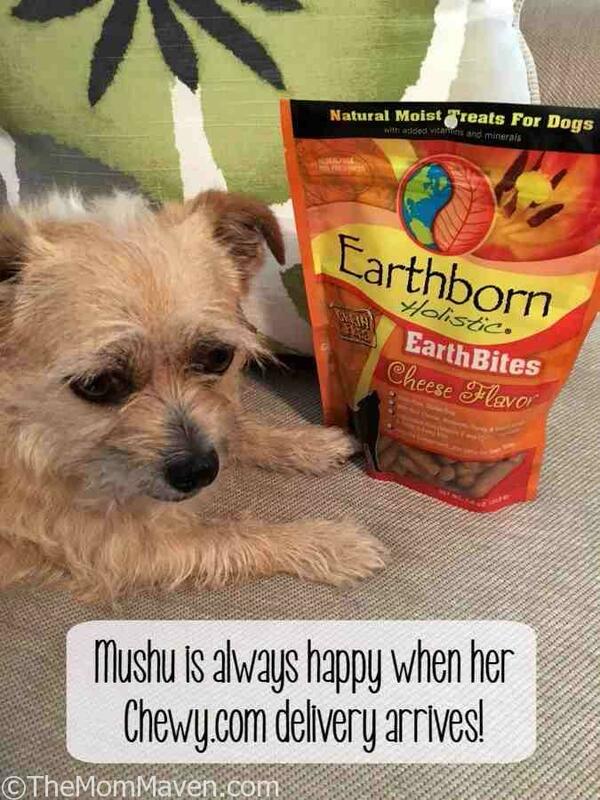 This month she received the Earthborn Holistic EarthBites Cheese Flavored Dog Treats to try out. Earthborn Holistic EarthBites Cheese Flavor moist treats are sure to be a flavorful treat your dog will love. These cheesy treats contain real, dried cheddar cheese and a mixture of wholesome vegetables and fruits, such as peas, apples, blueberries, carrots and spinach for high palatability in every bite. This antioxidant-rich formula will help meet your dog’s daily nutritional needs while satisfying his taste buds. For me, the most important thing about these treats is that they are grain-free. The fact that they are anti-oxident rich is a bonus. I also like that these are made with real cheese, peas, apples, blueberries, spinach, molasses, honey, and maple syrup-real foods! The Earthborn Holistic EarthBites are small and great for use during training. Of course the most important thing of all is that Mushu loves them. She loves cheese so these treats were a really easy choice for her. I’m just glad I can give her these instead of sharing my cheese with her. These treats are available at Chewy.com for $5.99 for a 7.5 ounce bag. Don’t forget, all orders over $49 receive free 1-2 day shipping! Click on over and get some for your favorite dog today. Mushu gives them 2 paws up!